As a Gujarati girl from an English medium school and college, I would be like “Kevi Rite Jaish” if someone would ask me to go watch a Gujarati movie. A movie should walk with the present times or throw factual light on history. Our industry was kind of stuck somewhere in between. Gujarati’s are one of the most modern people I know; hence it was a shame that our movies didn’t portray the wonderful culture. That was a few years back. Until this wonderful movie about this guy wanting to go to study abroad released. It was a milestone, and I knew times would change now. The movie was ‘Kevi Rite Jaish’, by Abhishek Jain. Mark the ‘sh’ here. Thanks for it. I have been scolded every time I say ‘s’ instead of ‘sh’ at home, hence Gujarati movies were confusing. 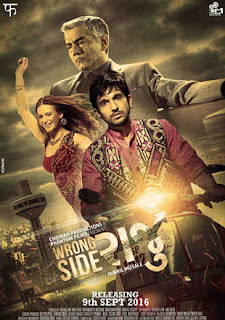 So after this movie I felt have badhu saru ‘thai jashe’. Gujarati films were all about ‘gamda’; now we are talking about and showing our modern cities and people. Watching a good Gujarati movie is like eating our famous ‘chikki’ for me. Wholesome, sweet, satisfying and somewhat salty – but most of all familiar. What a gratifying feeling to see a movie in your mother tongue which you can connect to! I definitely want to see great films come out from Gujarat. It felt amazing to see everyone come together for ‘Wrong Side Raju’. The fact that Mikhil Musale’s movie was co produced by Phantom is definitely great news! The movie is no doubt a very good effort. The protagonist Pratik Gandhi’s dialogue ‘sheher ma raste rakhadta kutrao karta amir baap na chokrao vadhre che’ sums up the classic panorama of our dry but jugadu city – with its bootleggers, rich sons, their rich dads and the ‘kadak badshahi’ that we are synonymous with. Oh and our love for ‘gori’s’. I am sure almost all of us have atleast once seen a guy roaming around with a foreigner gori around the old city, Natrani café and especially during Navratri and Uttarayan. Only people living in a dry city would know how guys like Raju are indeed transformers – the underdog heroes who transform from bootleggers to travel agents to drivers to tourist guides and what not. The city can’t do without all these Raju’s. When Raju corrects his client saying “it’s not business, but start up” you know that the movie scene is also catching up with the times in a city famous for its business acumen- even Jason Statham would start a “side business” if he ever came here apart from his job of being a transformer. ‘Tari aankh no afini’ being sung on the karaoke, a drunk version of ‘chapti bhari chokha’ and ‘gujarati ma selfie etle potiyu’ catch the humor in just the right proportions, at perfect timings. The ‘pol nu ghar’ with the mandatory chowk, traditional handicrafts on the blue wall and a store room full of empty liquor bottles is simply fabulous – a typical Gujarati household. It wouldn’t be wrong to say that this is the right kind of cinema. From the same old love stories to the ones glorifying the underdog, we have indeed come a long way. Hence I say Raju e wrong turn lidho ne Gujarati Film Industry sidhe pate chadhi gai. Bahu saras... With a 's' .